The footballing world is waiting with bated breath for tomorrow's UEFA Champions League second leg showdown between Manchester United and FC Barcelona and all eyes are on the progression of Lionel Messi as he recovers from a facial injury sustained in the first leg. 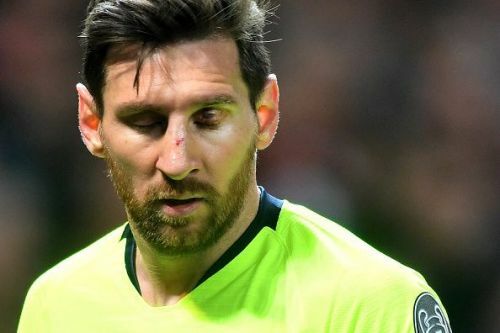 A seemingly unintentional elbow from United defender had caught the mercurial Argentine in the face and had left him bleeding from the eyelid and the nose. Barcelona haven't progressed past the Quarterfinals stage of the UEFA Champions League in the past three seasons and the pressure is immense on Valverde to deliver, especially since the La Liga is already in the bag. The defending champions Barcelona are 9 points clear at the top of the La Liga table, with only 8 games to go. Messi was instrumental in the first leg, providing a pinpoint cross that ensued in Luka Shaw bundling the ball into his own net, ensuring Barcelona grabbed an all-important away goal victory. The Blaugrana carry a 1 goal advantage going into the fixture, but cannot take Manchester United for granted, especially considering the kind of fight and desire they showed to overcome a 2-0 first leg deficit to Paris Saint Germain with a 3-1 victory in Paris. Ernesto Valverde, the Barcelona manager had rested Lionel Messi in this weekend's La Liga encounter against Huesca. He revealed today in the pre-match presser that the talismanic Argentine is all set to return against United. Incredibly, the 5 time Ballon d'Or winner has never scored in a Champions League Quarterfinal! "Messi is fine and perfectly ready for tomorrow," Valverde remarked, adding "That Messi has 12 games in the quarter-finals of the Champions League without scoring means he is closer to scoring. The statistics are good because they are based on the past and they do not say anything about the future"
Barcelona faces off against Manchester United, at home at the Nou Camp on Wednesday, 12:30 pm Indian Standard Time.